Three Palestinian minor detainees submitted sworn affidavits saying that they are being subjected to maltreatment, verbal and severe physical abuse by Israeli army and police forces, either prior to or during their detention, according to Commission of Prisoners’ Affairs (CPA).Heba Masalha, a CPA attorney, was allowed to visit three Palestinian minors who were recently detained by the Israeli authorities, and reported on their affidavits. According to WAFA Palestinian News & Info Agency, the lawyer reported on minor detainee Ameer Arar, 17 from Ramallah village of Burqin, as saying that he was brutally assaulted by Israeli soldiers in Megiddo jail. Arar was reportedly attacked with the butts of the forces rifles on his head and legs before being detained from his home a few days ago. Arar said that soldiers kept on beating him until he fell to the ground, after which they began to kick him with their booted feet and hands. He said one of the soldiers grabbed him firmly and coiled his arm around his neck, making it very difficult for him to breath, while another soldier struck him hard on his back. Arar, who couldn’t lift his worn-out body off the ground, was dragged to the military vehicle despite of his injuries; Arar sustained a fracture in his foot, in addition to various injuries across his body. Arar said that he woke up to find himself laying on the ground with wet clothes at an Israeli military camp, where forces reportedly stamped on him and attacked him with stones, before he was taken to al-Jalameh investigation center near Haifa, where he was slapped around during interrogation, which he said caused him a great deal of agony and fear, joined by the severe pain that engulfed his body as the result of the beatings he received. Another prisoner, Shadi Jabarin, 16 from Shuafat refugee camp in Jerusalem, said that on 29 June 2015, around 15 Israeli undercover personnel, dressed in Palestinian clothes, mercilessly attacked him – beating him on the face, head, back, and legs with their weapons and booted feet – while he was present near the camp before detaining him. Jabarin sustained serious bruises and wounds throughout his body, which he said caused him a great deal of pain. After he was moved to Russian investigation center in Jerusalem, investigators took turns to beat him, which he said further increased his already intolerable pain. Like Arar and Jabarin, prisoner Rateb Hemoni, 17 from the Jerusalem neighborhood of Silwan, was also brutally assaulted; physically and verbally, while he was handcuffed and eye-folded by Israeli police officers who detained him on 25 May 2015. Due to the intensity of the beating he was receiving, Hemoni fell to the ground multiple times during his transfer to an interrogation center, during which soldiers stamped on him and dragged him in a brutal manner, causing him bruises and injuries throughout his body. As he was being interrogated, Hemoni was strapped down to a chair and subjected to severe beatings and verbal abuse. Hemoni remained in the interrogation center for 36 days before he was transferred to HaSharon Israeli jail. On January 19, an attorney with the Commission reported that Palestinian minor prisoners incarcerated in Israeli jails are routinely subjected to physical torture during their detention and throughout the course of interrogation. “By the end of January 2014, it was reported that a total of 183 Palestinian children were prosecuted and detained in the Israeli court system, a rise of 18.8% over the month. The figure includes twenty children between the ages of 14 and 15,” reported the Middle East Monitor in a story. “Around 500 – 700 Palestinian children, some as young as 12, are arrested, detained and prosecuted in the Israeli military detention system each year. 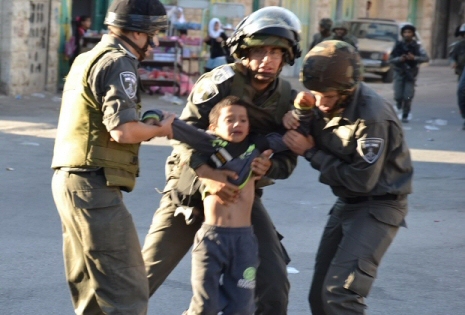 The majority of Palestinian child detainees are charged with throwing stones. No Israeli children come into contact with the military court system,” said Defense for Children International (DCI). More than 200 minor prisoners, out of about 5,600 Palestinian and Arab political prisoners, are currently incarcerated in Israeli jails. Search IMEMC: ‘DCI-Palestine’ for related stories.